Together we have built a large online community to help battle the deadly disease ALS Society of Canada is dedicated to fight against; Amyotrophic Lateral Sclerosis. We have also built event management systems, online donation systems, fundraising pages, and many micro sites to bring ALS awareness where it is today, online. Look for Intrigue's sign on the golf course during one of ALS Society of Canada's golf tournaments where Intrigue is a very proud sponsor of over the years. 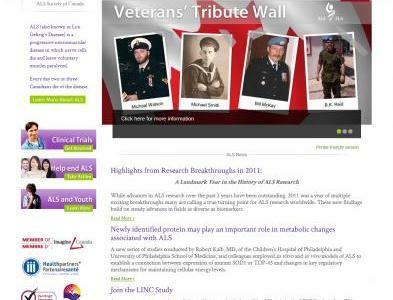 Visit the ALS Society of Canada's website and please, donate to their cause.